Look! Up in the sky! It's a bird! It's a plane! It's a suit! And not just any suit! It's the signature blue, red, and yellow suit mild-mannered reporter Clark Kent wore as Superman, and it's flying in from the Smithsonian for a special appearance. See it at the Ohio History Center, the headquarters of Ohio History Connection, in Columbus starting Saturday, October 10, 2015. It'll join more items of 1950s pop culture newly added to the exhibit 1950s: Building the American Dream, where you can see it from October 10, 2015, through January 3, 2016. On special loan from the Smithsonian's National Museum of American History in Washington, D.C., the super suit was worn by actor George Reeves, who portrayed mild-mannered reporter Clark Kent and his heroic alter ego, Superman, in the TV series the Adventures of Superman, which aired nationally from 1952–1958. 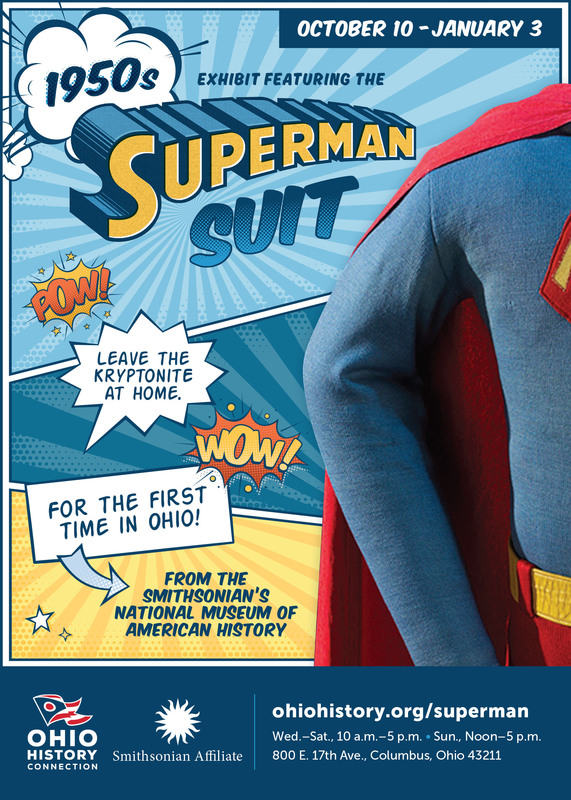 To learn more about Superman.s signature suit, we interviewed Dwight Blocker Bowers, a graduate of Ohio's Hiram College who's now Curator of Entertainment History for the National Museum of American History. How did the Smithsonian come to have the Superman suit? The suit came to the Smithsonian from D.C. Comics, which owns the rights to Superman. In 1987, the Smithsonian's National Museum of American History did an exhibition celebrating the 50th anniversary of Superman, and D.C. Comics donated the suit along with many other Superman items, including watches, games, a cookie jar and a poster for the 1966 Broadway musical It's a Bird…It's a Plane…It's Superman. We don't know exactly. It isn't credited, although we do know that a designer named Izzy Berne did costumes for the Adventures of Superman from 1952–1954. It's wool jersey and was worn with a muscle suit made of cotton muslin underneath, which would have made it very hot under TV lights. It's quite durable—even after all this time, it still has no snags. Who wore the Superman suit? It was made to be worn by George Reeves. He went from playing Brent Tarleton, one of the Tarleton twins who appear in the first scene of Gone With the Wind, to "B" films in the 1940s. I think TV saved his career—Superman made him a star, something he hadn't attained in film. What's the coolest thing about it? The big red "S" on the chest. Was there more than one suit? It was probably one of several. There were usually backups. Are there stories or legends about it? There's nothing about the suit itself. D.C. Comics claimed the suit after the Adventures of Superman ended, and it stayed in D.C.'s vaults until it came to the Smithsonian. Is it normally on display at the Smithsonian? It was on exhibit in the museum's Popular Culture Hall until 2006, when the museum closed for renovation. The museum has since reopened and the Superman suit will go back on display in a future exhibition exploring American culture from the colonial era to the present. Have you acquired any Superpowers through your association with it? No—it doesn't seem to transmit its powers. What's this about a grey-and-black suit? There was a grey-and-black version with a brown belt, made for filming the show in black-and-white. In black-and-white, it looked the same as the blue, red, and yellow one does. We'd love to know where it is. Are there issues you face in preserving the Superman suit? We exhibit it on a custom-made mannequin so it doesn't get distorted in any way, and we keep it out of light when it's not on display—light is the biggest enemy of fabric. Why is it important for the Smithsonian to preserve items like this? Superman's motto is "truth, justice and the American way." He's an icon of American culture. Why do you think that Superman has remained so popular for so many years? We're always looking for a hero. Superman has stayed rooted in American culture, and his exploits weren't so fantastic that we couldn't understand them. He's durable—every generation remakes or recasts him. For example, to many Americans of the 1930s, when Superman first came into being, President Franklin D. Roosevelt, whose programs and efforts helped save the day by pulling the nation through the Great Depression and World War II, seemed a real-life counterpart of the fictional superhero. It's also the media—Superman has been represented in every form of media, from print and films to Broadway. The 1966 Broadway musical It's a Bird…It's a Plane…It's Superman at the Alvin Theatre in New York wasn't a big hit—it ran for 129 performances—but it was well-reviewed and had a good score—as good, I think, as Bye Bye Birdie by the same composer-lyricist team. It got amazingly good reviews for a show that ran for a very short period. There was also a version of the musical done for TV in 1975. It was campy and didn't even make prime time—it appeared as a late night movie. You can still see it on YouTube. Does the Smithsonian have the costumes of other superheroes? Yes—among others, we have Wolverine from X-Men: Days of Future Past, the cowl George Clooney wore as Batman in the movie Batman & Robin, Spider-Man from the Broadway musical Spider-Man: Turn Off the Dark and Xena from the movie Xena—Warrior Princess. How did you come to be at the Smithsonian? I came here in 1981 to produce record albums, then gravitated toward entertainment history and, as the heroine of Anita Loos' Gentlemen Prefer Blondes said, "fate just keeps happening to me." Going into the collections room and having the opportunity to interact with stuff I never thought I would, especially the puppets—we have Charlie McCarthy, Howdy Doody and Kermit the Frog. One of my favorite objects is two pieces of wood hinged together that make a slapping sound—a literal slapstick from the early days of American comedy. Also, having the opportunity to meet some of the people who've created America's entertainment legacy—for example, Carol Burnett. (The museum has the famous green drapery-rod dress she wore in her 1976 parody of Gone With the Wind.) You pinch yourself and say "I can't believe this is happening to me." Are there sources you can suggest for learning more about Superman? Yes—the book Superman: Serial to Cereal by Gary H. Grossman. I refer to it a lot. This article originally appeared in the September/October 2015 issue of Echoes, newsletter of the Ohio History Connection.